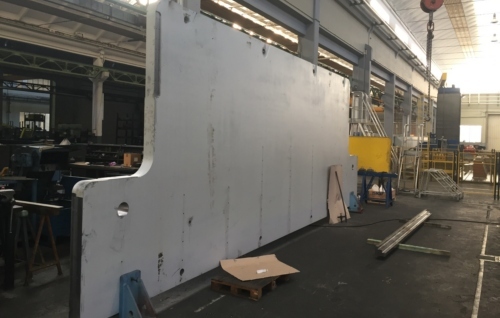 Beam or movable beam or traverse - is the movable and main top part of press brake with the installed punch to be moved down towards to the bending die to perform the bend. Usually in 99% of press brake models the movable beam is situated on the upper side to move down to the non-movable table. In typical CNC press brakes the beam has the controlled stroke with the guidelines situated on the both sides of the machine. The unit to perform the movement of the beam could be, depends of the press brake type - pneumatic or flywheel mechanical (usually for old machines), hydraulic (for all main trademarks of the press brake and all economic series) or servo-electric (the new generation and the most modern technology in press brake construction). Because of the length usually all machines have controlled movement based with independent control of each side of the press brake to allow finally the perfect parallelism to the press brake table. 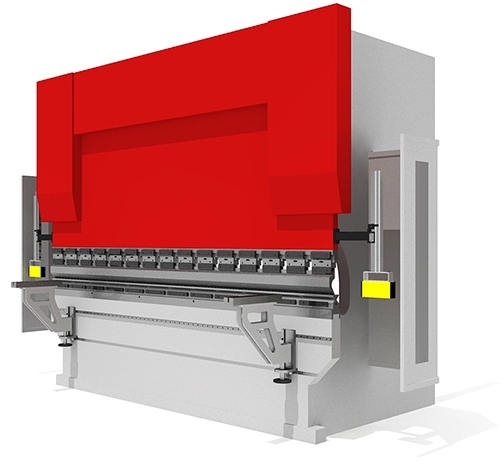 The execution of the beam also could be different depends of the manufacturer of the press brake to be connected with shoulders or completely separate plate off the shoulders. The movement of the beam is usually worldwide identified as the Y (or Y1, Y2 for both sides) axis. In addition it is important to know that the beam is only one main press brake unit to form the bend, all other machine movements are used only for the part positioning. In the zero of stroke and the uppermost position the distance between the bottom of beam and the top of the table is identified as the daylight or max. opening. In addition it is possible to tell about execution of beam in tandem and tridem construction of press brake. In these machines mainly composed as two or three single machines the beam performs the same action but should be precisely synchronized to be moved simultaneously for both or three machines without any difference in in-time positioning. There is no easy possibility to replace the press brake tools system on the beam because of construction. For example the configuration of connection of Promecam system to the beam is side-top; Trumpf-WILA - only top. So normally the tool system is pre-manufactured in the configuration of the ordered press brake machine from the manufacturer.